Your little princess will feel like royalty in this palace filled with vintage chandeliers and Disney princess furniture. 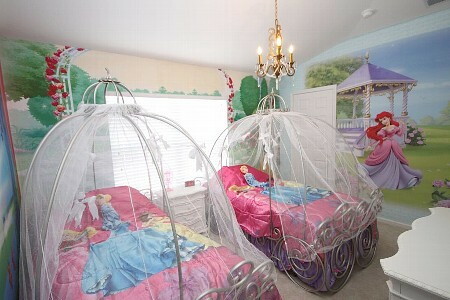 A magical Mickey room is perfect for the kids and adults who are young at heart. Oh, and did we mention the 46” LCD HDTV, high-speed wireless, and Nintendo Wii? This 3 bedroom, 3-bathroom house is a parent’s dream come true at only $105/night. Roar! 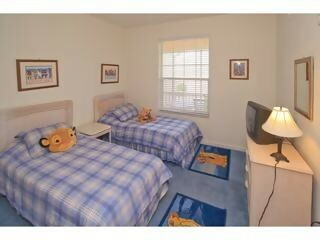 Your little lion cubs will shower you with hugs when they stay in this Lion King themed room. Even better, this 2 bedroom 2-bathroom condo comes with hardwood floors in the living and dining rooms, a full kitchen, and an unbelievably low price tag of $54/night. 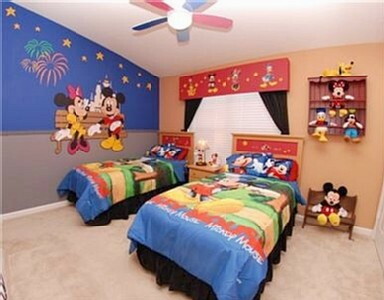 Your little Mouseketeer will love the Mickey themed bedroom and bathroom. This 3 bedroom, 3 bath vacation home comes with multiple 5-star reviews, and amenities with the young child in mind: a private pool with a safety fence, a backyard to toddle around in, a pack-n-play, a high chair, and a stroller. And for mom and dad, don’t forget the free high-speed wireless, 42-inch plasma TV with cable and a stereo surround system. Rates start at $105/night. 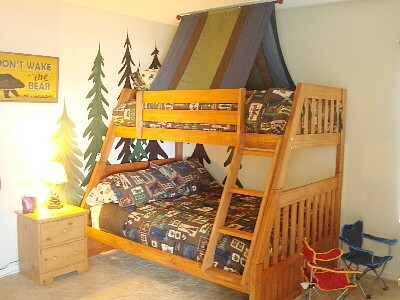 Camp out in this wilderness-themed room complete with its own climbing wall! After your kids have rock climbed to their little heart’s content, they can swash-buckle and search for buried treasure in the pirate’s room, or nap in the Disney princess bed underneath a castle. 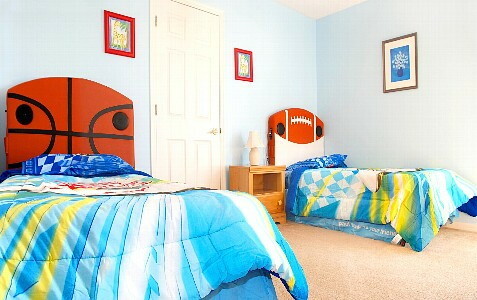 This 7 bedroom, 4.5 bathrooms Disney vacation home sleeps up to 15 people comfortably and is perfect for family reunions. Rates start at $175/night. 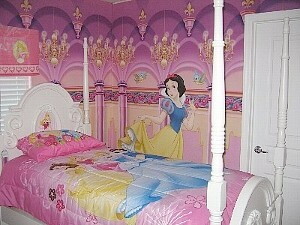 Your Disney Princesses and Jedi will delight in this 6 bedroom, 4-bath family vacation home, complete with two Disney Princess rooms, a Star Wars themed bedroom, and a Mickey bedroom for those who love all things Disney. And for the adults, a 63-inch TV, Nintendo Wii, Xbox 360, high speed wireless Internet, Desktop PC, your very own air hockey table, and a pro-grade pool table. Oh, and did we mention that the place has a pool with a water slide? Rates start at $230/night. Did you know that you could live in your very own 62-acre private theme park? The crazy-unique amenities are endless… a private lagoon pool and waterslide, three carousels, a marsh for bass fishing, a home theater with fully reclining seats, and a room filled with 23,000 colorful air-filled balls below a climbing wall. This 8 bedroom, 8-bathroom dream vacation home comes with a private tag of $2,875/night and according to the 5-star reviews it is worth every penny. Score! This 8-bedroom vacation home has 4,000 square feet worth of space for a fun family reunion. Kids will love the basketball beds with surround-sound speakers, foosball table, pool table, and 30-foot long pool in the backyard. Rates start from $172/night. 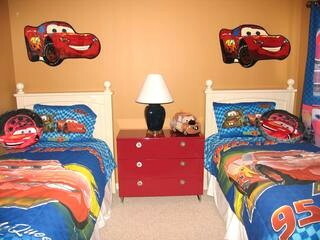 Recharge your batteries in this family-friendly vacation home featuring a Cars room, Princess carriage and toddler beds, a Mickey room, and a nature-themed master bedroom with a sturdy crib. With eight bedrooms and two separate pools for adults and kids, this vacation home was designed with the whole family in mind. Rates start at $325/night. 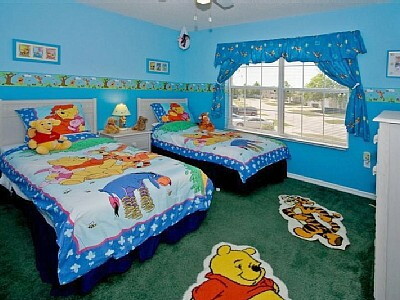 Kids love to play in this Pooh inspired room! 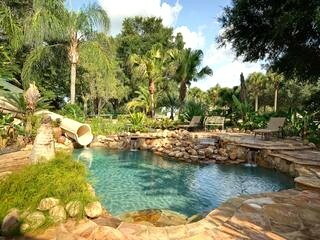 This 7-bedroom lakefront home features a backyard pool lined with mosaic dolphins and a Mickey room complete with HDTV. It also comes equipped with toys for all ages… from toddler trucks, to a foosball table, to billiards for mom and dad. Rates start at $200/night.